Before you step up to your weapons bench in Fallout 4, cram a hundred pounds of junk into it, and start tinkering with your favorite laser rifle, you might want to cast an eye on what modder LucasGod has been up to. Any Mod Any Weapon doesn't mince words, and could completely change the way you shoot monsters and robots. As you might have guessed from the name, it enables any weapon mod to be attached to any weapon, allowing you to lovingly craft the horrible and hilarious killing machine of your dreams. Fallout 4 mod enthusiast Tyrannicon shows what's possible in the video above, with his wonderfully enjoyable deadpan manner. Watch as he builds and tests a scoped triple-barreled electrified minigun, an alien laser pistol that's half Fat Man, and several other devastating Frankensteinian weapons. Clearly, anyone in Commonwealth who believes the saying "War never changes" has probably suddenly changed their mind, and if they haven't it's because their mind has been splattered into tiny chunks after stepping in front of the scoped triple-barreled electrified minigun. "Your custom weapon will inherit the base stats and attributes (Such as spread, bullet count and animation) from the base weapon you used, even if you change every piece into another kind of weapon. Attach a beam splitter to a shotgun and see the magic happens!" "Some restrictions still apply, so you can't attach a muzzle to a barrel that doesn't support muzzles, but you can attach it to a barrel that supports, and then change the barrel. The muzzle will most likely disappear but the effects will carry on." "Enemy weapon generation is kinda buggy with this mod, I recommend you use it only to craft your weapons, and disable it afterwards if you plan on looting genuine weapons from enemies until I manage to fix that." 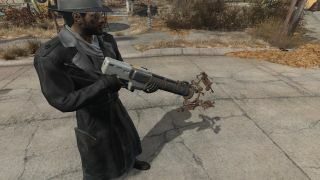 Any Mod Any Weapon was created with FO4Edit, and is available at Nexus Mods.